One of the more serious cases of dark stools is known as melena. What is melena? 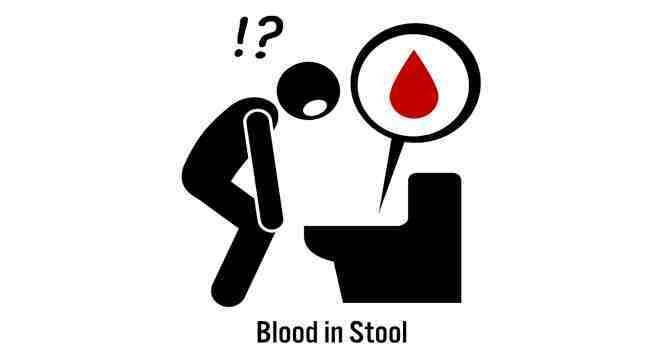 It is a medical condition resulting in black stools of blood or tarry stools. Passing black stool does not always indicate the presence of blood since the color can change depending what you consume. We will look at these causes of melena, as well how to treat more serious cases of stools with blood. Melena refers to the passing of tainted blood in the form of black, tarry feces as a result of upper gastrointestinal tract bleeding. Blood in the esophagus, stomach, small intestine, or duodenum can be affected by bacteria, oxidation, and digestive enzymes as it travels to the end of the large intestine and expelled through your stool. These factors can change the color of your stool to black or dark red, as well as give off a strong, unpleasant odor. Any bleeding in the lower parts of the small intestine, such as the colon, may have collected over time and can be seen with constipation. It can also involve the passage of old blood stemming from injuries of the nasal cavities or mouth. Dark stools can exist with only at least 50 milliliters of blood present in the duodenum, stomach, and esophagus. Melena usually is not evident until at least 100 to 200 milliliters of blood is present. Bleeding in these areas can result in bloody vomiting known as hematemesis, or hemoptysis which is bloody sputum with coughing. A disturbance in the system can cause melena to develop as well as reactions to what we consume. Iron-enriched foods such as dark leafy vegetables, blueberries, and black licorice may cause darkening of the stool. It can also occur with medications and iron supplements. However, the presence of bloody or tarry stools needs to be investigated to rule out serious complications. Irritation, trauma, and inflammation of the esophageal inner lining known as esophagitis, as well as esophageal ulcers, can cause blood to appear in your stool. Bleeding can also occur due to esophageal varices. These are abnormally large veins caused by an overflow of blood when the blood flow to the liver is hindered. Gastrointestinal conditions such as gastritis, gastric ulcers, and peptic ulcers may lead to bleeding in the digestive tract and result in bloody stools. Gastrointestinal bleeding can appear as a slow blood leak from a major hemorrhage. Also, a non-bleeding ulcer can start producing blood as a result of prescribed and over-the-counter medications. The most obvious sign of melena is a dark color of the stool. There are other symptoms to watch for that may also explain the origin or cause of the condition. When you see black or tarry stools, it is always best to get a medical diagnosis, as melena may not be the cause of your condition. A rectal examination, including laboratory testing of the stool, can confirm a melena diagnosis as well as any accompanying gastrointestinal conditions. We know stools that appear tarry and dark may stem from leaking blood vessels, trauma to the esophagus, or a bleeding ulcer. So, the doctor may have you do a stool culture test as well as blood tests, x-rays, barium tests, and a colonoscopy. An esophagogastroduodenoscopy (or EGD) allows visualization of the inner lining of the esophagus, stomach, and duodenum. This test involves a flexible scope with a camera lowered into the gastrointestinal tract through the mouth or nose. Once the doctor confirms a melena diagnosis, you can begin treatment for the underlying cause. In the case of severe bleeding, you may require immediate hospitalization along with intravenous fluids, a gastrointestinal endoscopy, blood transfusions, proton pump inhibitors, or even emergency surgery. Non-emergency instances of melena may be treated with ulcer medications, antibiotics, antacids, and anti-inflammatory drugs to target any inflamed regions. If the bleeding is caused by a current medication, the doctor may suggest switching to a less harmful medication. Natural treatments you can follow at home may require a change in your dietary habits like increasing your intake of water, adding high-fiber foods, and limiting or avoiding spicy and fried foods, as well as alcohol and tobacco products. You may be able to get relief for symptoms with the use of natural herbs and following a few lifestyle changes. Ginger and Senna: Mix five grams of equal parts of dry ginger powder and dry senna leaves powder in a glass of lukewarm water. Drink at bedtime. Buttermilk: Mix salt and pepper into a glass of buttermilk. Drink one glass daily until the symptoms clear. Sesame Seeds: Combine half a teaspoon of raw sesame seeds with butter. Munch on this mixture daily. Rose Petals: Ground up 10 rose petals and half a cup of water for a drinking solution. Drink once a day on an empty stomach for three days. Incorporate yoga poses into your routine such as head stand, wheel pose, shoulder stand, mountain pose, sun salutation, and standing forward bend pose. Melena can be alarming in most instances. Unless you have consumed food or medication that darkens the stool, chances are you may have an underlying health condition that requires attention. Depending on the accompanying symptoms, the color of the stool may indicate a blood disorder or a more serious case of cancer within the gastrointestinal tract. Extensive diagnostic tests can narrow the cause and determine the proper course of treatment. By making a few changes to your daily routine and using natural products, you may be able to treat or prevent melena and its symptoms. “Bloody or tarry stools,” Medline Plus; https://medlineplus.gov/ency/article/003130.htm, last accessed August 11, 2017.